I had very few memories of All Dogs Go to Heaven, even though I do remember it being very popular upon release – on the same day as The Little Mermaid. I’d seen it once before, but my memories of it were mixed up with Lady and the Tramp, another dog-centric animation I’ve not rewatched since childhood. 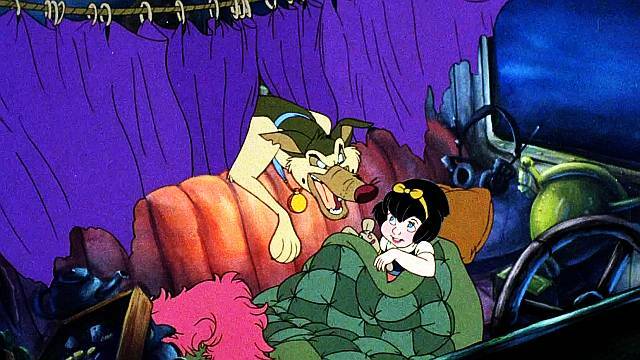 Well, I’m going through Don Bluth movies at the moment – slowly – and next on the list was All Dogs Go to Heaven, his follow-up to the smash hit The Land Before Time. Don Bluth’s weakness tends to be story execution, which is why it works so well when he’s teamed up with another director – like Spielberg. But he famously disliked having to give up control, and was clearly enjoying his freedom with this movie, introducing themes of gambling, decadence and seedy underworld dealings to a family flick. Unfortunately, a lack of strong theming or likeable characters drag the whole thing down. The film centres on Charlie, a rakish German Shepherd voiced with aplomb by Burt Reynolds who sadly fails horribly as a central character on account of being incredibly hard to like. He’s got the typical character arc of being selfish, irresponsible and manipulative, only to find his heart of gold when push comes to shove, but that happens only in the very final act, leaving way too much of the film centred on his being an unlikeable boor. Fun interactions with Dom Deluise’s Itchy character and even an amusing first trip to the Pearly Gates don’t save the character, his design is bizarrely ugly and unmemorable, and Reynolds’ singing voice is atrocious. So it falls to the little girl who can talk to animals, Anne-Marie, to be the emotional centre of the film. Adorable as her voice actress Judith Barsi was as Ducky in The Land Before Time and deeply saddening though the poor little girl’s story was in real life, unfortunately Anne-Marie just isn’t interesting. She’s like a pint-sized Snow White, but with even less personality. Her characterisation is bland and her animation is that weird, creepy coquettish-baby thing Disney used to do a long time ago but thankfully gave up well before the 80s. On the other hand, the animation is the film’s saving grace. It’s often beautiful, inventive and much more experimental that what Disney were putting out at that point. There’s some very impressive work with cars, scenes of Hell and various races. It still looks impressive, though Bluth’s habit of rotoscoping humans often looks jarring here. The story veers wildly here and there, and the performances, heavily ad-libbed, often confuse. Killer is particularly incomprehensible, and I’m fairly sure his laser gun was written as a regular gun but changed to appease censors. The music is perhaps the worst of any animated movie I’ve seen, with most of the songs lacking any melody or hook and being delivered with way too many distractions from the on-screen action. ‘You Can’t Keep a Good Dog Down’ and ‘Let’s Make Music Together’ are the saving graces of the soundtrack, though the bubble effect put on Ken Page’s voice was a terrible addition, and his cameo role only made me want to go and watch The Nightmare Before Christmas instead. Don Bluth was capable of great things, and this movie is well-remembered, but unfortunately it’s not even close to his best, and probably won’t hold up well in years to come.